Announcing: New, Exciting Handicapping Phone App for Apple & Android!! FREE Download! 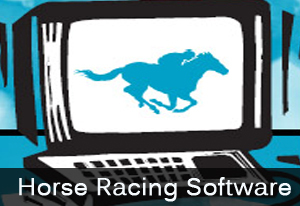 RPM is partnering with Pete Solano’s 2-Minutes-2 Post Handicapping Technology Firm to bring you the FIRST, truly accurate handicapping software program that is now available for your Apple or Android device. 2minutes2post introduces its mobile application, bringing proprietary algorithms for picking winners and unprecedented results for exotic wagers! 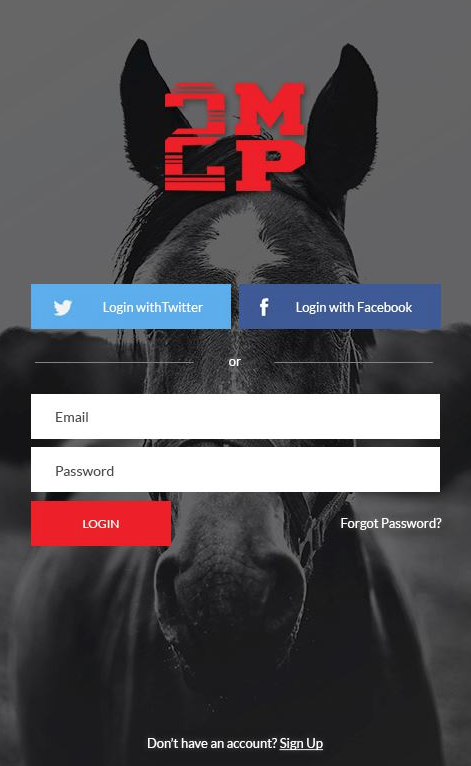 IT’S THE NEW MOBILE APP HORSEPLAYERS NATIONWIDE ARE TALKING ABOUT! Picks and algorithm scores are AVAILABLE DAILY! 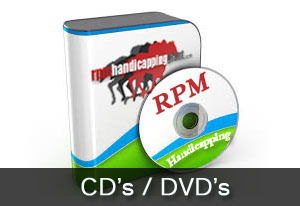 Adapts and adjusts to ALL TRACK CONDITIONS giving the handicapper a huge advantage. Available for EVERY U.S. RACE TRACK. 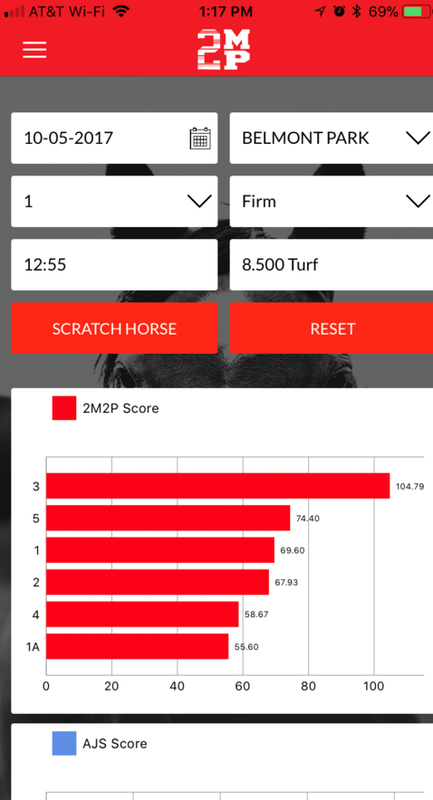 App Selection Screen – When you choose and pay for your track, 2MP App immediately crunches & calculates over 221 crucial Handicapping Factors and graphically displays your selections in ranking order via the red graph lines. Also, when you scroll down, you will see a new graphing screen called ‘AJS Score’. This employs another algorithm that expands into the realms of multi-datapoint pace, form & trainer considerations. When the 2MP2 Score top scorer also matches the top AJS scorer, you have an extremely solid play. Recent database studies show Exactas hitting at a 35% rate using a 3-horse box — 44% using a 4-horse box. 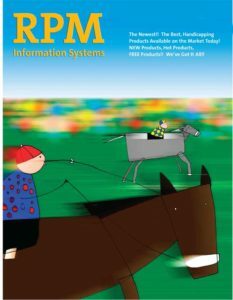 Uses data from multiple database handicapping vendors, including speed figures and other performance figures. Download 2minutes2post RMS App from your mobile store (Google Play, Apple App Store) for your Android, iPhone, or iPad. Select desired Race Date (see Race Date field) – Picks available for past & current date only. Future dates are not available until day of. After Race Track selection, you will be prompted for purchase. You will then be prompted to add a credit card form of payment. 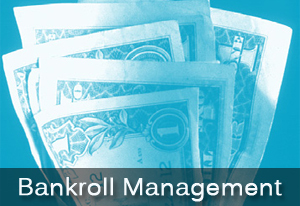 After successful payment, your desired Race Track data will load automatically. If you purchased 10 tracks or 30 tracks, each time you want to load a new Race Date / Race Track you will be prompted with “Purchase this track?” question. Your number of track credits will deduct by one each time you buy a new track. When all track credits are used, if you want to load another track 2M2P mobile app will prompt for another credit card payment. 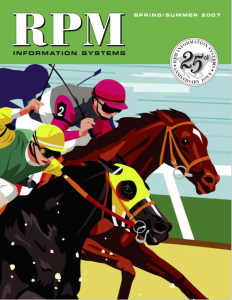 The 2MP2 APP provides you with an unprecedented amount of important, crucial handicapping data, all ‘summed-up’ in proprietary, accurate and dependable algorithms that provide you with a winning edge at the racetrack. Downloading the APP is Free. An individual track costs $2.95, but you can buy packages of 10 or 30 track downloads at big discounts. The cost per track is much, much less expensive than purchasing an actual racing form, and with the 2MP2 App, all of the handicapping is done for you, INSTANTLY! To help you pick more winners! That is our sincere goal — and why we work diligently to keep you on the cutting edge of handicapping technology. If you have any questions feel free to use the Contact Us button on the website. Thanks!